As seen on The Clever! A number of designers are today recognising the benefit of designing products and furniture that last longer, that actually grow with the child. Above, high chair to... well, a chair. This simple (yet bold) design by Maartje Steenkamp for Droog comes with printed "notches" indicating each stage of the chair. So when you feel the time is right, you can saw off what is not needed any more. Another "growing" chair is the Tripp Trapp. Designed originally by Norwegian furniture designer Peter Opsvik in 1972, Peter noticed that his son Tor had no chair that could position him at the correct height at the family dinner table and enable him to participate with the rest of the family. While the Tripp Trapp concept was not at first popular, it has now sold more than 6 million chairs. Showing that the concept of adaptable design is now being slowly recognised. The design's seat and footrest may be adjusted in both height and depth, thus it is possible to adapt the chair to the child as he or she grows. 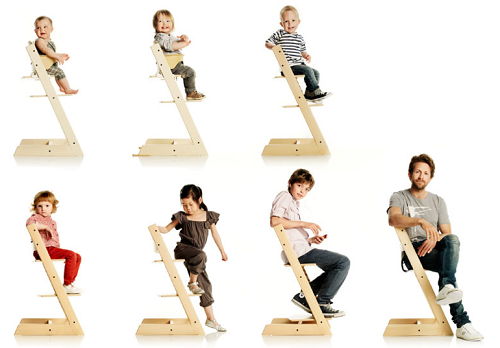 Additionally, the chair's design enables the child to safely climb up and into the chair all by themselves. Made from beechwood, the chair now comes in a variety of rich colour varnishes. Below, Swedish architect and designer Mia Cullen has produced this range of benches / stools for Orkester with adjustable seats, taking inspiration from traditional wooden peg furniture and piano stools. 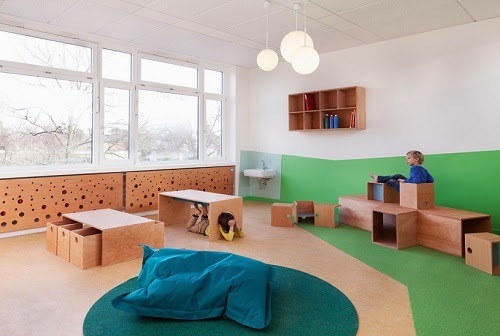 The adjustable seats which were first designed for schools and nurseries, allow adult and child to comfortably sit side by side and are now used in waiting rooms, entrances and public spaces. From chairs, benches to... beds. 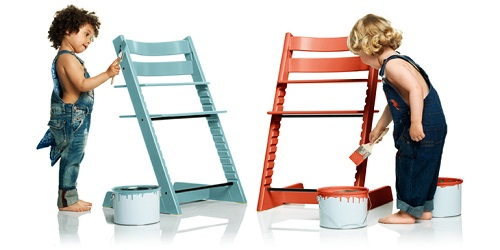 Also from Norwegian company Stokke is the ingenious Stokke Sleepi. The Stokke Sleepi is one clever cot slash bed, which can be used from a child's birth to 10 years of age. 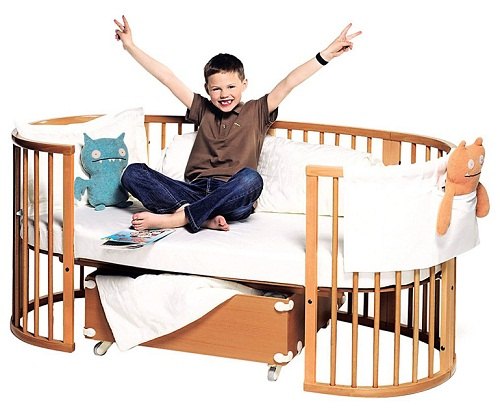 Made from beautifully crafted solid beech wood, additional parts mean that the cot can grow as your child grows. It also looks pretty funky too. These tables features adjustable legs, a simple yet oh so clever idea. 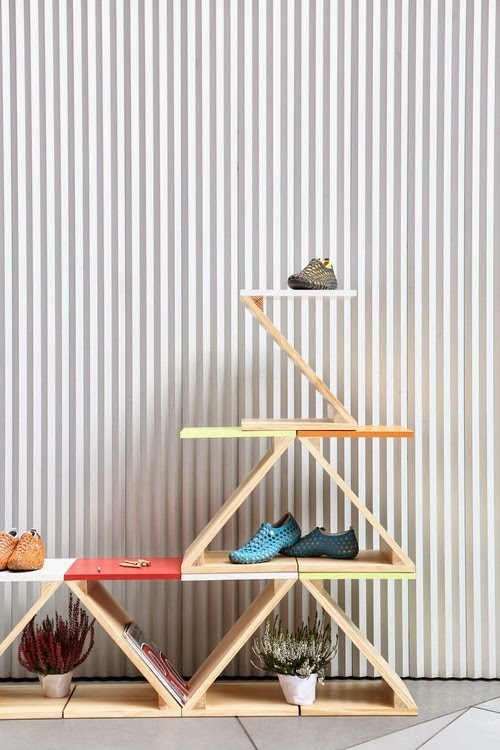 Consisting of a solid wood body, four coloured legs and rubber rings, the CASPAR table below designed by Martin Pabis and Thomas Maitz for Perludi allows the table to grow vertically with the child. Additionally, the table may be easily dismantled and hold it's legs inside the tray for simple storage. 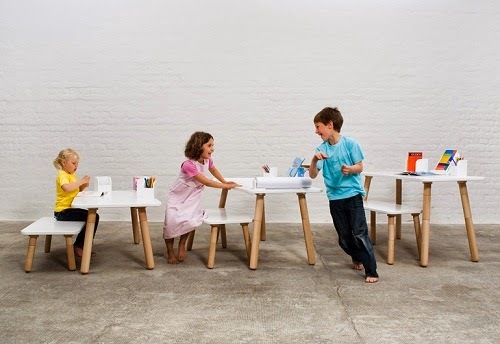 Another growing table is one from German company Pure Position, which grows with the child in four stages. Each stage introducing a section of leg. The table also includes a number of handy boxes for pens and notes - for work and play! And from one of our own, is the New Zealand designed Wishbone Bike. The Wishbone was born when Industrial Designer Richard built a bike for his son Noah to keep up with him on their daily walks. The bike's design has no pedals, which teaches the child balance and co-ordination. 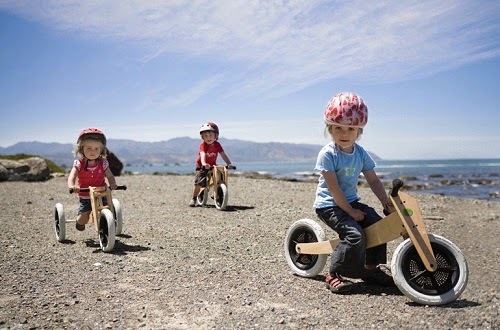 Starting as a three-wheeled ride-on toy for children who are just walking to a two-wheeled bike, the frame can then be flipped and the seat adjusted to accommodate children up to the age of five. These clever designers show you need not fork out for a new piece of designer furniture every time your child grows a few inches! Rather, designing with the future in mind results in furniture that grows, adapts and lasts (hopefully) for many generations. 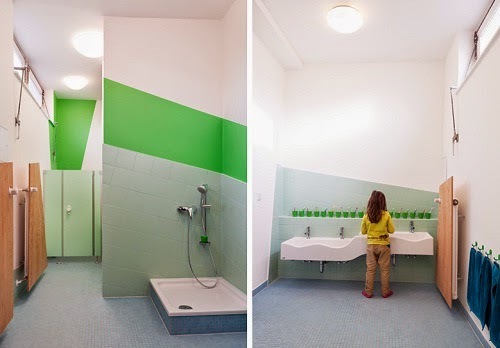 Via The Clever Design Store. Modular construction is a topic I've been blogging about a fair bit recently (see Make it Modular post). I just think the concept is so fitting for early childhood environments. For the functional possibilities and the flexible nature of their use. Take this 'Z' shape - termed the Zoo it is designed by Madrid based studio Mayice. It can be stacked for storage, arranged side-by-side into a coffee table or table, be a seat, a magazine rack, display shelving... oh the possibilities! 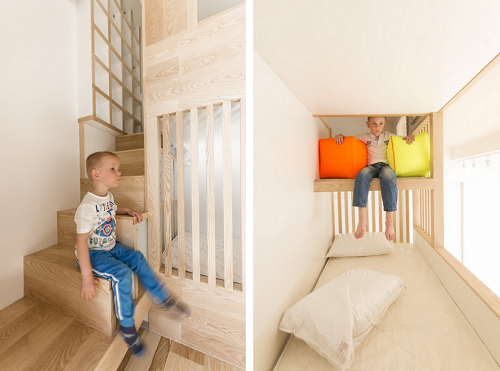 This renovated apartment designed by Ruetemple in Russia has an entire section dedicated to the youngest inhabitants of the house. 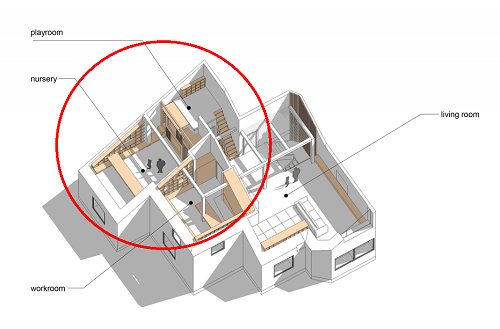 Termed the "Loft Apartment" - it is indeed designed like a loft. Or a treehouse of sorts. 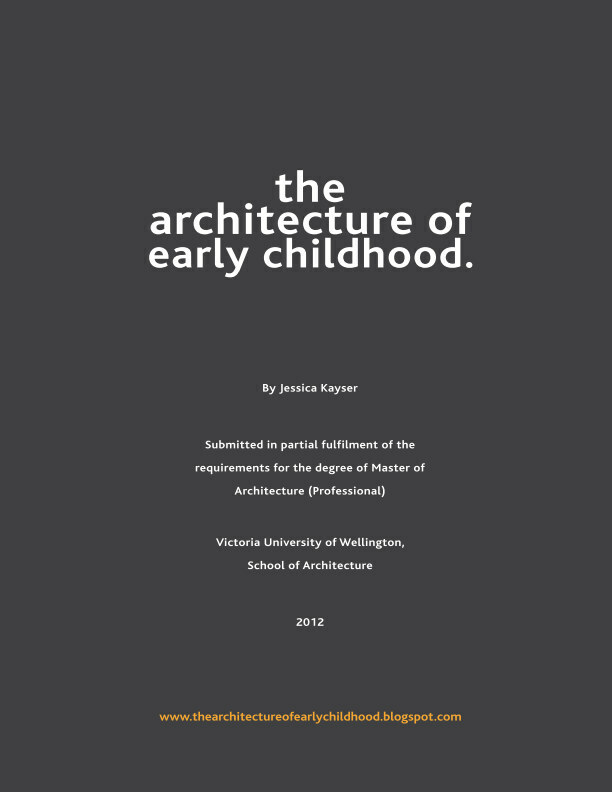 It is in fact similar to an early childhood centre design I did as part of my thesis studies. An architectural pallette of pale wood and light helps to provide a sense of space. While a layering of elements, including vertical wooden slats, criss-cross mesh, boxed storage walls, horizontal railing, safety netting, ladders and a whiteboard wall is combined to create a multitude of living and playful experiences to the apartment space. The diagram above showing where the child can go as opposed to the adult. 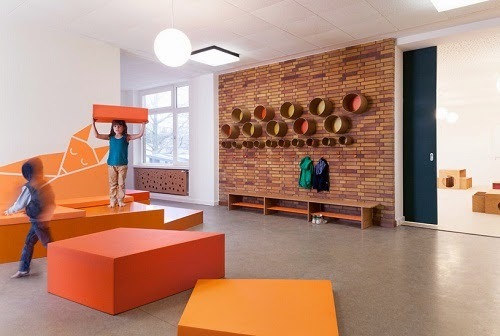 A large space to play - with bean bags offering a place for rest. 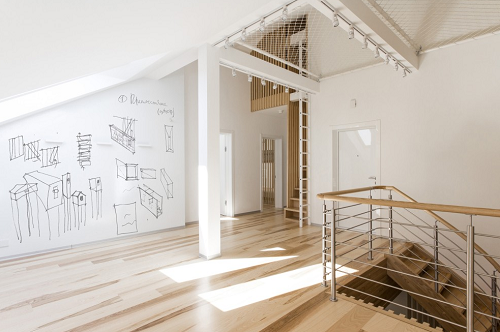 A steep narrow stair case goes up to the loft level, as does a ladder, which goes up the wall. Seen right is the loft or "attic". Clad entirely of plywood and housed with large cushions, it makes for a restful space in which to do some quiet activity. A whiteboard wall allows for brainstorming sessions and/or for purely creative expression. Ruetemple have also designed a similar apartment, except for students. 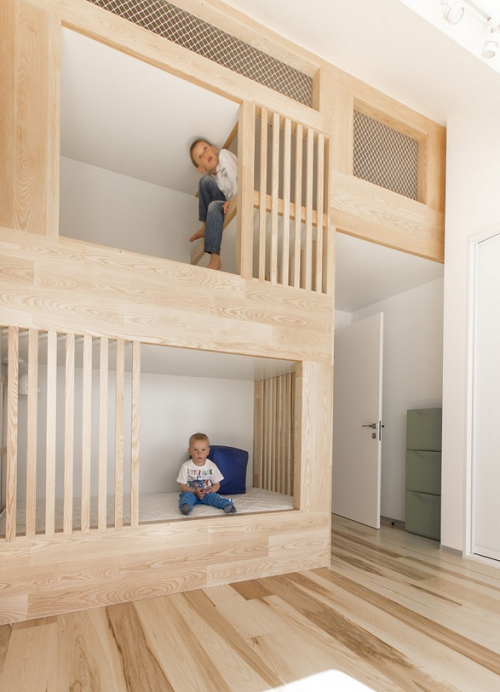 Again boxed storage walls, stairs, skylights and built-in desks are combined cleverly to maximise the use of space. All ideas which could quite easily be translated into early childhood environments. Although those stairs look potentially rather hazardous! I like to see initiatives that recognize children as competent individuals with abundant creative ideas and skills waiting to be realized. Therefore Kids in Museums gets a big tick from me. Their goal = to encourage museums in the UK to welcome children and families. Their main event is Takeover Day. 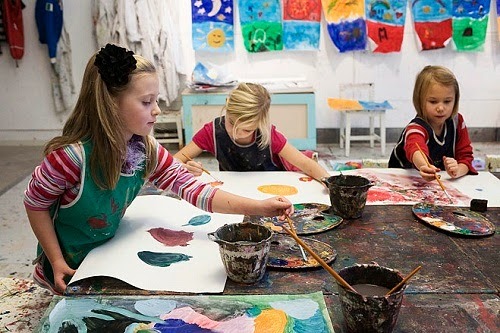 Held once a year, museums can sign up to invite children and young people to take over the museum for the day. Where among other things, children, wearing "I'm taking over stickers" meet and greet visitors, set up exhibitions, gather stories to tell and design visitor guides. As the Kids in Museums website says - "there was nothing children couldn't do - proving how putting them at the heart of a museum makes it a vibrant and exciting place to be, full of fresh ideas and new perspectives." 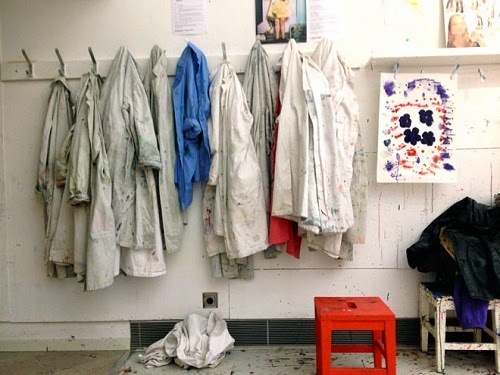 Museums are places full of potential for learning and of creative possibility. And if given the chance, may provide children with memorable experiences. 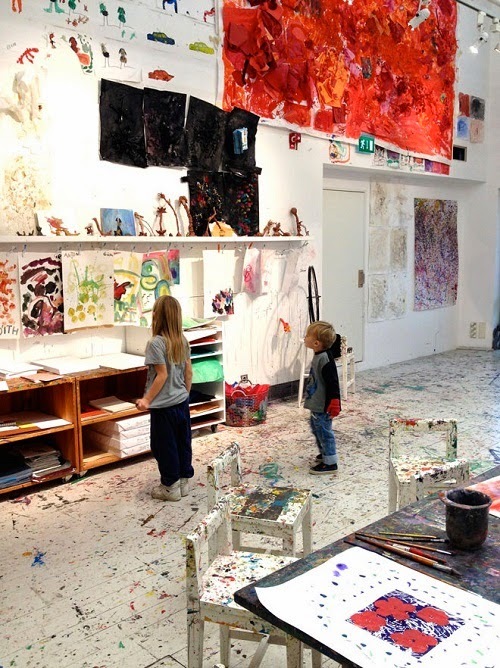 One museum, the Moderna Museet museum in Stockholm is offering what looks to be a fantastic artistic workshop experience - love the large space with artworks and paint all over the floors, walls and tables. 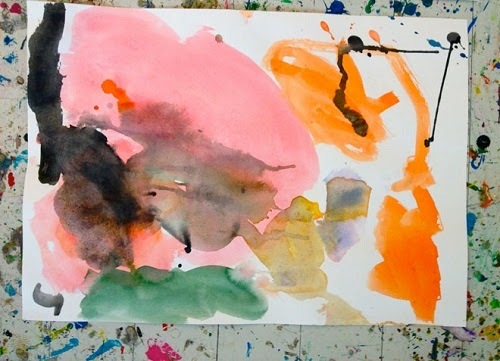 Every Sunday is Family Sunday, where children aged 2-6 are taken on a tour of the museum and then taken to the beautiful workshop where they paint, draw and sculpt using what they've seen and learnt as inspiration. Super excited about the new launch of CleverBastards which has just been reborn as The Clever: Design Store. What started as a search for the cleverest NZ'ers (those "clever bastards") has now gone global - taking the same "clever" approach but sourcing like-minded product the world over. The Clever hunts out new designers, inspiring stories and clever products. I like how the home page integrates all of these things giving you loads of visual stimulation and choice for where ever your eye takes you. And there's a blog post by little ol me in there too! Pictured above is a post on clever furniture that grows with the child (you can read it here). 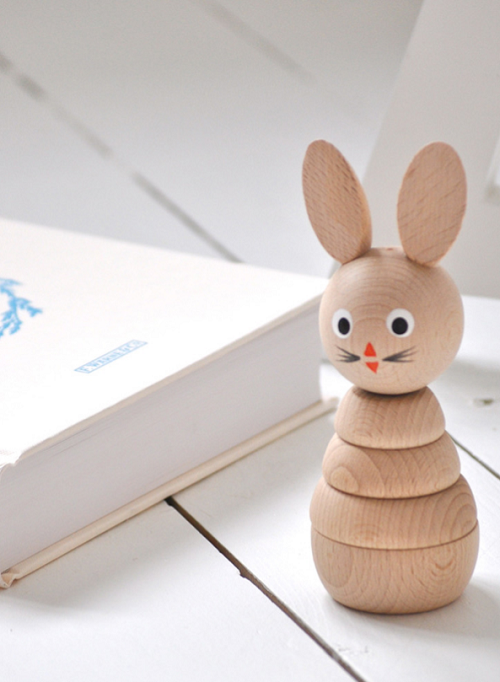 The online shop also features a few kiddie products, my favs of which are below. 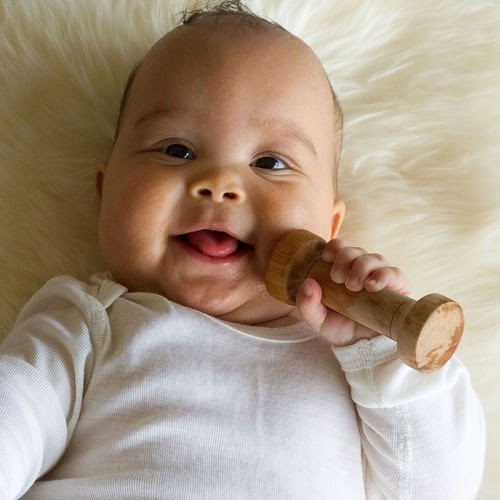 Baby Dumbbell Teether by Petit Voyage from Manawatu. Happy Little Poppets by The NZ Skincare Company from the Waikato. 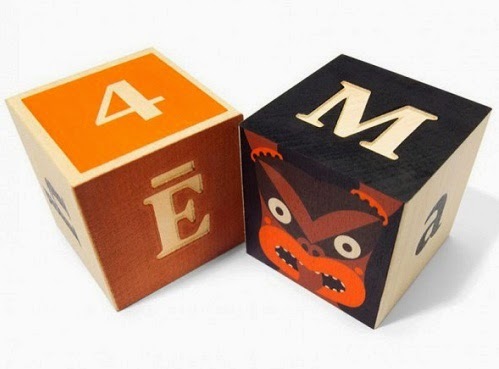 Maori Alphabet Blocks by Johnson Witehira from Wellington. 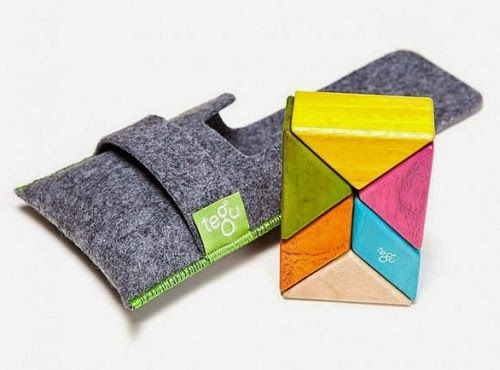 The Pocket Pouch by Tegu from Honduras. I remember when my brother was born, my mother getting my sister and I to create a black and white cut-out and geometrically patterned hanging mobile. 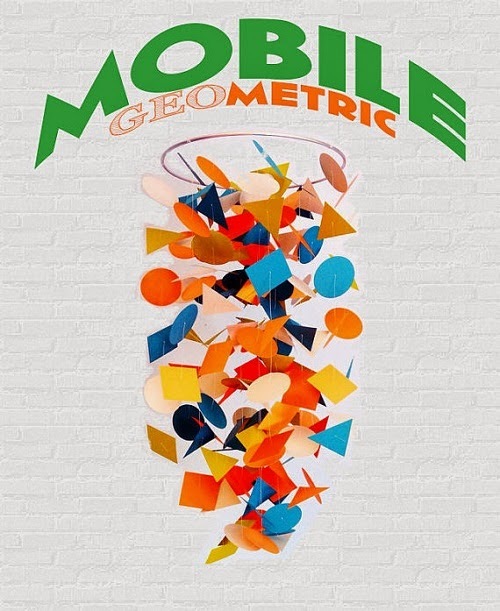 The theory being that the geometric pattern and movement of the mobile was to encourage the child's development (improve sight, develop motor skills and brain development) via visual stimulation. See the examples below as inspiration and even (like my mother) enlist other children to help! Natural objects found in the garden creates a delicate mobile, like the one above made by Kristina from Lovely Morning. Takes a wee bit of patience but the endless and colourful varieties (as seen below) ensure a fun way to brighten bubba's room! This colourful version is made by merakiandco available from Etsy. Paper Runway have come up with this tutorial which uses coloured card and sewing. And above, some examples of paper ornaments suspended from a thin metal frame available from MoMA. From top-left, Birds in Harmony by Christel Sadde and Katsumi Komagata; Balloon Mobile from Christian Flensted; Traffic Mobile from Tom Schamp and Christel Sadde and the popular Themis Mobile by Clara Von Zweigbergk, which comes flat packed enabling you to build your own. 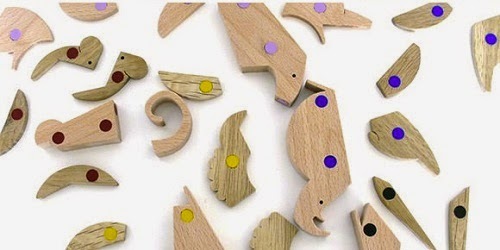 Check out these beautifully crafted children's toys made by UK design studio Sarah and Bendrix. Made of unvarnished polished natural wood insures these sculptural objects are safe for children. 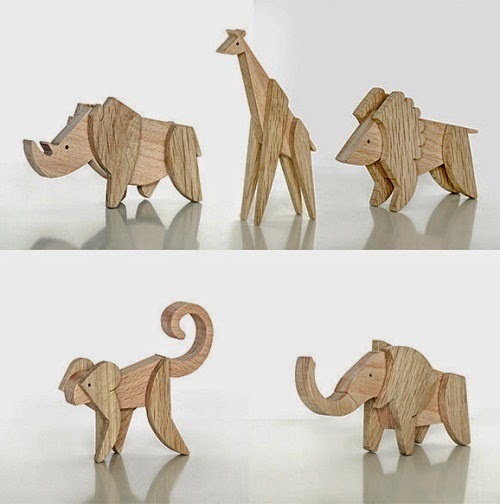 And from an architecture studio Archabits is this new range of wooden animal figures. Also natural and unvarnished / painted, the animals may be taken apart and put back together again with embedded colourful magnets. The interchangeable parts allow kids to imagine weird and wonderful creatures or to simply construct the traditional animal figure. Invest in well-made classic kids toys and they will bring joy for (hopefully) many lifetimes.